The Spanish capital and many major cities in Italy bring in traffic restrictions due to prolonged pollution. Also, truck news roundup: Upset in Belgium over apparently clear cut case of social dumping. Imminent strike Rotterdam. Mega-trucks authorised in Spain. New document rules for drivers visiting Italy. Record year for Eurotunnel. Another episode of Madrid pollution today with speed cut to 70kmh on the M-30 inner ring road. 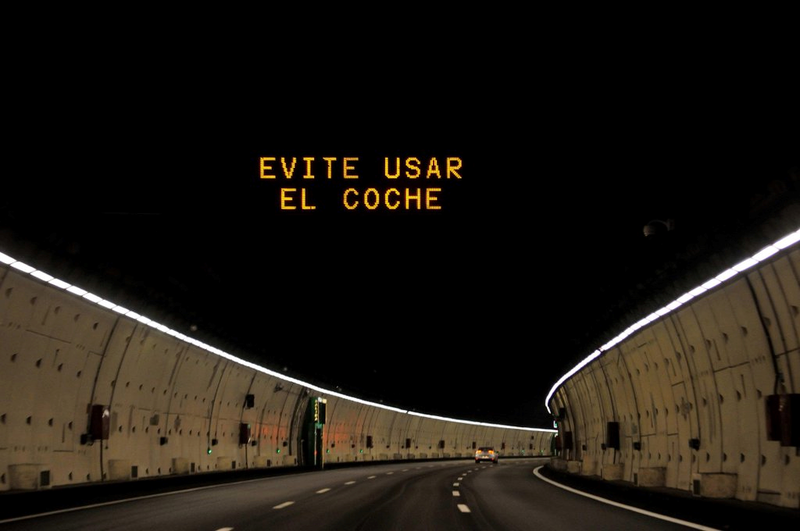 ‘Evite usar el coche – avoid using your car,’ say the city information boards. This is the forth pollution alert in the Spanish capital since new rules went into effect in November. It has also banned cars from on-street parking in the city centre twice in that time. Meanwhile, persistent smog is leading to traffic restrictions in many Italian cities. Milan will ban private vehicles from the roads 10-16:00 next Monday, Tuesday and Wednesday (28-30 December) with the surrounding municipalities likely to follow suit. Rome also decided on a total ban but has since downgraded the measure to ‘alternate traffic’, depending on whether the last number of the registration plate is odd or even. Turin, Bergamo, Bologna, Florence, Naples and other cities too have their own restrictions (see this map). Drivers should be prepared to park on the outskirts and travel in to city centres by public transport. The authorities may decide next week to extend or increase traffic restrictions. 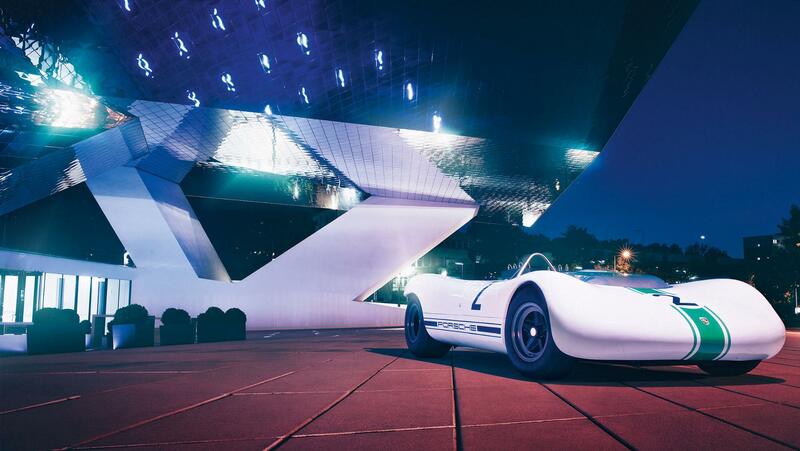 An end of year photo series from Porsche called No night at the museum (1). Various of its historic models are pictured outside Stuttgart’s architectural landmarks, including this 909 Bergspyder from 1968 at the firm’s very own Porsche Museum. See more. Truck news roundup: ROTTERDAM. Docker union FNC Havens voted almost unanimously in favour of strike action in the New Year reports Ship & Bunker. The dispute is over potential job losses in the container section due to new automation. How this may or may not affect ferry services is not clear. The union issued an ultimatum which expires on 6 January. BELGIUM. Consternation after it emerged ‘hundreds’ of Weberer trucks are parked up in a field in Opglabbeek, east Belgium (and other locations in neighbouring countries) for the Christmas holidays (via HBVL.be). The drivers were reportedly bussed back to Hungary. This is clear evidence of social dumping it is claimed whereby drivers from the East (predominantly) work in Western Europe but on pay and conditions set in their home countries, thereby undercutting local firms. Social dumping and other ‘social conditions’ for truck drivers will be a hot topic next year with a new EU ‘Roads Package’ due in June. More later. SPAIN. ‘Megacamiones’ – aka Ecocombi or LHV Longer Heavier Vehicles – are now authorised for use on the roads reports the CETM Confederación Española de Transporte de Mercancías. The 25.25m, 60t monsters with at least six axles will only be authorised with permission from traffic authorities, and even then only on fixed routes and on motorways ‘whenever possible’. The government says studies, and experience in the predominantly northern European countries which already allow LHVs, show benefits in terms of energy savings, lower emissions, lower costs and, due to a reduced number of heavy vehicles on the road, improved safety. CROSSING THE CHANNEL. A week before the year end, Eurotunnel says it has broken its all-time freight record. So far in 2015, the Channel Tunnel operator has carried 1,464,880 freight vehicles between the UK and France beating the previous high set in 2012. Interestingly, it also said it still has 45% infrastructure capacity available. Earlier this month Eurotunnel announced it had carried its 23 millionth truck since commercial services started. ITALY. Truck drivers are required to carry documentary evidence of the load – i.e. ‘International Consignment’ – in a new Stability Law in force since Tuesday (22 December) reports Trasporto Europa. The measure is intended to tackle abuses of cabotage regulations. Penalties include detention of the vehicle until the evidence is provided, and fines ranging from €400-6000.